Are controls on dirty money worth what they cost? 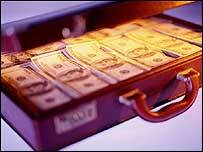 UK businesses are paying too much to fight money laundering, a new survey suggests. Backed by the City of London and the Institute of Chartered Accountants, the report says the cost of regulation to fight money laundering is too high. Its authors say the businesses surveyed were "overwhelmingly negative", complaining that the UK was heavily regulated - but no better protected. The cost could drive businesses out of the City, the report warned. The report was commissioned by the Corporation of London and the Institute of Chartered Accountants in England and Wales in the wake of new rules which came into effect last year. The rules, the result of the massive 2002 Proceeds of Crime Act, extended a duty to report suspicious activity from the financial sector to all businesses handling "high-value" transactions, such as jewellers, estate agents and car dealers. The result, experts say, has been a surge in "suspicious activity reports" to the National Criminal Intelligence Service, swamping its staff. But according to the authors, consultancy Z/Yen, most of the 386 responses to an online survey said the extra regulation was failing to produce results - although they acknowledged that those who were unhappy were more likely to have responded. The Corporation of London's Michael Snyder said in a foreword to the report that the UK applied international rules with "particular vigour". That vigour was, however, reaching a "tipping point where past, current and future costs of the legislation are perceived to be greater than the benefits". The report calls for stiffer penalties, more publicity for successful cases, more sharing of feedback from helpful reports and better application of existing rules for seizing criminal assets. Senior police officers say they are doing precisely that. The Metropolitan Police recently launched a strategy for economic crime, dubbed Operation Sterling, which focuses its existing resources on taking money from criminals. But one recent court case may prove a setback. The Court of Appeal ruled earlier in June that three men convicted of conspiring to launder £170m should be set free. They had not known for certain that the money was the proceeds of crime, the appeal court judges said.